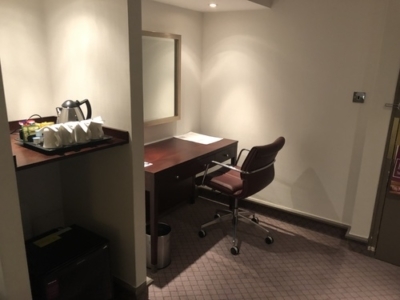 This is our review of the Hilton London Gatwick Airport hotel, at the South Terminal. With an early morning meeting in the diary to plan Virgin Atlantic’s sponsorship for our Christmas party, I ended up spending the night at Gatwick Airport. 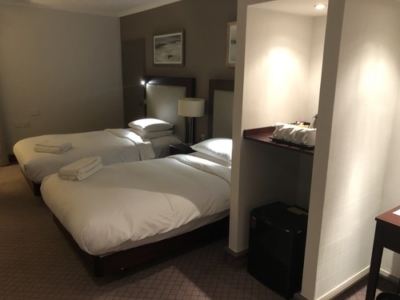 We decided to kill two birds with one stone and add another hotel to our collection of Heathrow and Gatwick airport hotels reviews – click here for the full list. We booked the hotel using 30,000 Hilton Honors points from Rob’s account, since it was a last-minute booking where cash rates were higher than you’d usually expect. Connectivity is a little lacking, as you’d expect for an older hotel. There is only a single plug socket beside the bed and to use this you had to unplug the bedside lights! 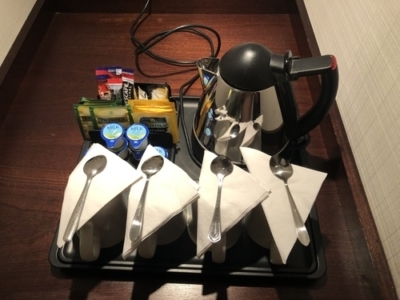 The room comes with an empty mini fridge, kettle and tea/coffee selection. If you are an Hilton Honors Diamond status holder they give you your two bottles of water at check-in, which you must carry up yourself. This would be annoying if you have lots of bags, which luckily I didn’t. The décor is in fairly good shape despite having a slightly outdated design. The bed itself was comfortable. In most hotels I find myself overheating since the rooms are temperature controlled and the duvets heavier than they need to be. At the Hilton, however, the lighter duvet was perfect for me. This is an airport hotel with many guests staying in order to catch very early flights. This wouldn’t have been a problem if the room had a bit more soundproofing. .… I ended up waking up at the same time as an Italian family next door. I was also woken a few times by doors slamming shut. Breakfast is served on the ground floor in the Garden Restaurant. It is the usual selection of hot and cold food, though I did spot some smoked mackerel! No smoked salmon, however, unlike at the Crowne Plaza I stayed at recently. 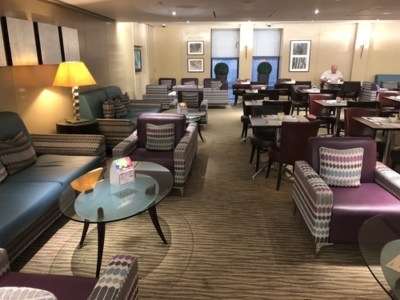 The Executive lounge, open to those in Executive rooms and those with Hilton Diamond status, is mainly set up with tables and chairs alongside a few sofas. The only newspapers they had were the i and the Irish Independent (! ), which I thought was a little disappointing. …… as well as complimentary drinks and canapes early evening. I didn’t see these as I arrived very late. 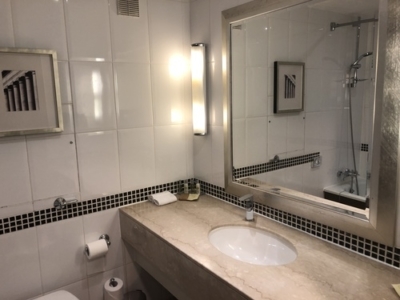 Though it won’t be winning any design awards in a hurry, the Hilton London Gatwick Airport does have the unique selling point of being the only hotel within walking distance of the South Terminal building, even if it is a maze to get to! That said, there are a number of walkable options at the North Terminal – primarily the new(ish) Hampton by Hilton which we reviewed here and which has free breakfast for everyone – and there is a free monorail linking the terminals. The Hilton Gatwick building is very spread out, and thanks to its size it felt both a little soulless and difficult to navigate. With a little clearer signage, and potentially some room renumbering, they might be able to make it a little easier. On the whole, it was a pleasant but not outstanding experience as you’d expect from your average airport hotel. Hilton Diamond members will find it better value as they will get free lounge access. Cash rates vary – they were around £149 when we booked but I can see midweek rooms as low as £71 in January. The standard Hilton Honors redemption price is 30,000 points although it drops a little lower on dates where cash prices are also low. Given our standard value of a Hilton point of 0.33p, a redemption can be good value on nights where prices are £100+. 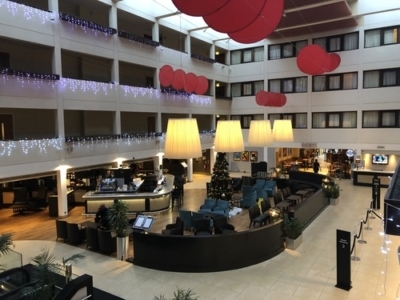 You can find out more about Hilton London Gatwick Airport on its website here. I’ve stayed here plenty of time and most of the currents are pretty reasonable. However, there’s a newer wing with more modern rooms that are far better than those in the main building, albeit a long walk away. 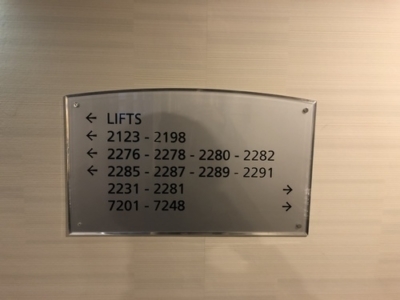 If memory serves me correctly, they’re the rooms that start with a ‘7’, so 7324 would be the new wing, third floor, room 24. I switched to the Bloc Hotel within the airport recently. That was interesting, but perfectly reasonable for the two short overnight stops I had. I stay here a lot and have always had an upgrade due to diamond. Last week I arrived from Glasgow at 8am had a coffee at the Costa and at 9am asked about dropping my bag, she said as diamond I can check you in. I paid £69 public sector rate and by 9.30 I was in the exec lounge having breakfast. Went into London and came back at 6.30 for canopies and drinks. At 8am I was having breakfast again. I did well for £69 let me tell you that. I’ve been looking at public sector rates, the only downside is that you have to pay up front, but I guess if you make a flexible booking you could check the public sector rate a few days before and change if available. Did you have to show any ID? I don’t tend to carry mine unless working so would need to remember it if so! I’ve not been asked for my ID whenever I’ve stayed. In fact, at hotels with digital check in and digital key, there has been no need for me to visit the front desk – have just gone straight to the room and opened my door using my phone. Same with check out, just left the hotel and then received the invoice via email after 12pm. Have always taken my ID though just in case they ask. Stayed here before a recent trip to Florida – unfortunately I would be somewhat more harsh in my review: I thought it was an overpriced dump. My party had 3 rooms & had to change several times to find ones that didn’t smell of sewage. Sound proofing is definitely an issue as well, so the location is really the only thing going for it. We stay every year for our pre-christmas visit to the UK and have found it great every time. Obviously we all know that any hotel has good and bad days so I may just be lucky, we are always upgraded (Gold) and get a room very similar to this. It can be a bit of a drag (sorry for the pun) with your bags to get there but is my preferred in Gatwick hotel, if I have more time I will stay at the Arora in Crawley as you have access to the town and if I was going to Virgin Atlantic I would stay at the Premier Inn opposite so I guess Rhys was luckily you needed a review. You live abroad, yet you actively choose to stay here when visiting the UK pre-Xmas? Really? Didn’t they say this hotel was going to be hugely improved when it was taken over by Arora recently? The block that’s physically inside the building you mean? Plus in all honesty we loved.bloc, with kids it’s a fantastic choice before a 5am start – soundproofed, dark, and bunk beds – what else ya want? Yes, I’ve stayed at the Hilton and the Bloc and my preference is for the Bloc. I don’t need a full hotel facilities for an over night stay. Price drives me so last time I was at the Hampton which wasn’t bad, but I was leaving from Sth terminal so had to go back. Booked the onsite Premier Inn for £35 for a night in Feb, half the cheapest other rate. Again will need to travel to the other terminal but don’t care! I stay here frequently (over 40 nights this year) I am diamond and always get upgraded to the new wing (close to exec lounge) but yes a decent walk from reception. Paul C’s shortcut was very useful but it was closed off months ago. Exec lounge staff are usually very good and are very helpful but evening food has been substantially reduced this year. Now, just soup and a bread roll plus 2 small sides (pakora, spring roll or chicken wings) and a small tub with a few sticks of carrot or cucumber. Not enough for a meal. ‘New wing’ Highly recommended but is now at least 14 years old! I much prefer the Hampton at the North Terminal. Reception can be a bit frosty but the rooms are so much nicer and often receive an upgrade to a corner room. Found the bed in a corner Hampton room VERY hard. Got the extra duvet for the rollaway bed to use as a mattress topper and it was still a bit hard! As a Diamond member did they not offer you a side plate for your Pain Au Chocolat? Nah, that would have been a pain. Is a diamond allowed to book a room for someone else and allow them to receive the benefits? The hotel must have been aware of your name, because they have no history of giving anything other than an executive room (or deluxe room) for diamond members. 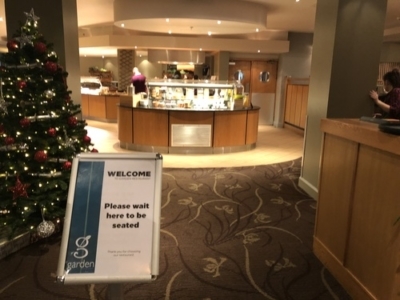 One of my colleagues spent the week in the hilton gatwick south this week and reported back to me as im supposed to be staying there for 11weeks on the bounce from mid jan next year and his feedback has now got me considering staying at the sofitel and using the transport to get to work in the south terminal. Alas my work place wont spring for anything other than a basic room. 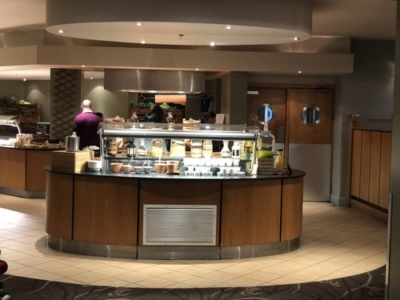 Although it kind of goes against the grain for HfP points readers as there is no loyalty scheme that I’m aware of for it, lots of people I’ve met who stayed at Gatwick have recommended the Premier Inn and said booking ahead rates are fine. 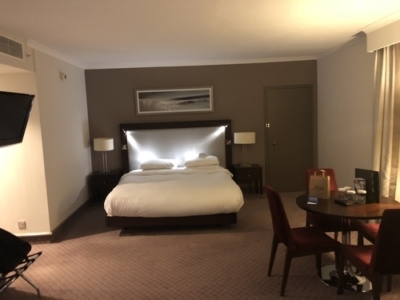 Given the 55 nights im going to be away from home i have to offset it a tad getting something out of it ie hilton honors points or club accor points if i change to the sofitel. Thanks for the heads up though! Honestly it’s not that brilliant of a Sofitel – I don’t think there’s a great deal of difference between the Hilton and Sofitel – and I don’t think it’s worth the extra schlep. The Premier Inn – it’s very busy and the lifts will drive you mad if you are there for any length of time! But as a one off it’s not a bad option. I was booked in there too (thought I’d put Rhys in one hotel and me in the other to get 2 reviews) but in the end I decided to let him go alone. 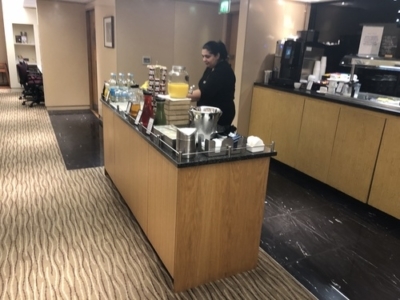 Looked perfectly ok.
I’ve stayed at Hilton Gatwick, it’s usually very reasonably priced, mostly cheaper than the Hampton so with Diamond benefits it’s a no brainer for the odd overnight. Also always get upgraded to the newer wing. For a late flight into Gatwick it’s ideal to get the GE into Victoria in the morning and you can leave your luggage at the concierge. 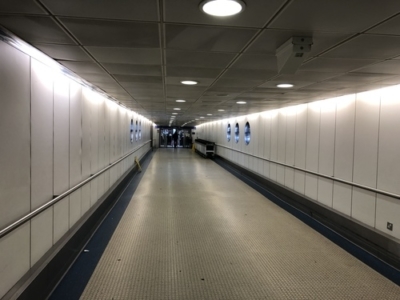 I *HATE* what they did at Gatwick, you used to be able to walk through the carpark – negating the idiotic stupid foolish pathetic (add any negative verb here) lift down to walk up in the corridor. There was a door from the carpark which connected directly to the far end of that souless corridor – it just meant walking though the car park. 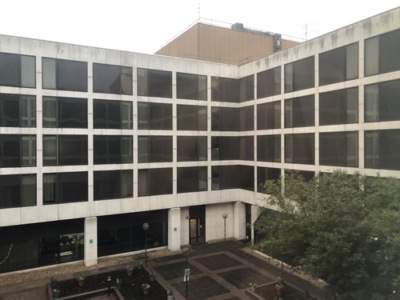 However, it would seem the idiotic management at Gatwick (supposedly – according to the hotel) saw this as far, far too sensible, and despite the doors still being there – they are now boarded up!!! I wonder when they will start trying to sell you items on that walk – adding in stuff that will make GIP more money ? Was told that when the South Termonal was refreshed and super premium parking introduced, they didn’t want humble passengers bashing their luggage into the fancy cars, hence the lift…. I have stayed here often. Like others have mentioned, Honors members are usually upgraded to the new wing, which is light, cleaner, though also colder and further from reception. I have also found the wifi to be very ‘iffy’ here. The hotel does seem reluctant at times to recognise diamond members but I do suspect this is because it is a very busy hotel and upgrades may not be readily available. 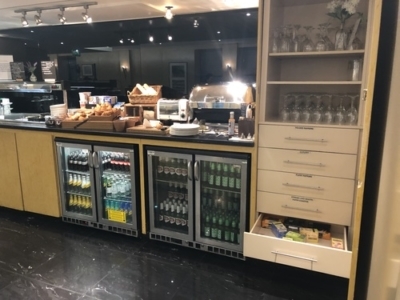 As for the restaurant, I have found it to serve one of the best breakfasts I have had in a Hilton and the service is nearly always prompt and friendly. Wifi is usually an issue in the garden restaurant, though. Did you spot the Gym by any chance? 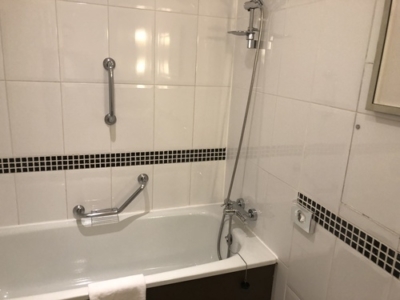 This is something I look for in a hotel and, in this hotel, it is just a small room by the rear entrance. Terrible hotel. Lounge like a zoo and found at least 20 moths in our just before going to sleep!